The Sopwith Pup was a British single seater biplane fighter aircraft built by the Sopwith Aviation Company. It entered service with the Royal Flying Corps and the Royal Naval Air Service in the autumn of 1916. 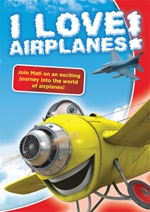 With pleasant flying characteristics and good maneuverability, the aircraft proved very successful. The Pup was eventually outclassed by newer German fighters, but it was not completely replaced on the Western Front until the end of 1917. Remaining Pups were relegated to Home Defence and training units. The Pup's docile flying characteristics also made it ideal for use in aircraft carrier deck landing and takeoff experiments. In 1915, Sopwith produced the SLTBP, a personal aircraft for the company's test pilot Harry Hawker. The SLTBP was a single-seat, tractor biplane powered by a 50 hp Gnome rotary engine. Sopwith next developed a larger fighter that was heavily influenced by the SLTBP. The resulting aircraft was a single-bay, single-seat biplane with a fabric-covered, wooden framework and staggered, equal-span wings. The cross axle type main landing gear supported on V-struts attached to the lower fuselage longerons. The prototype and most production Pups were powered by the 80 hp (60 kW) Le Rhone rotary engine. Armament was a single 0.303 inch (7.7 mm) Vickers machine gun synchronized with the Sopwith-Kauper synchronizer. A prototype was completed in February 1916 and sent to Upavon for testing in late March. The Royal Naval Air Service (RNAS) quickly ordered two more prototypes, then placed a production order. Sopwith was heavily engaged in production of the 1� Strutter, and produced only a small number of Pups for the RNAS. Deliveries commenced in August 1916. The Royal Flying Corps (RFC) also placed large orders for Pups. 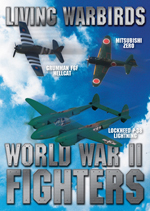 The RFC orders were undertaken by sub-contractors Standard Motor Co. and Whitehead Aircraft. Deliveries did not commence until the beginning of 1917. A total of 1,770 Pups were built by Sopwith (96), Standard Motor Co. (850), Whitehead Aircraft (820), and William Beardmore & Co. (30). In May 1916, the RNAS received its first Pups for operational trials with "A" Naval Squadron. The first Pups reached the Western Front in October 1916 with No. 8 Squadron RNAS, and proved successful, with the squadron's Pups claiming 20 enemy machines destroyed in operations over the Somme battlefield by the end of the year. The first RFC Squadron to re-equip with the Pup was No. 54 Squadron, which arrived in France in December. The Pup quickly proved its superiority over the early Fokker, Halberstadt and Albatros biplanes. After encountering the Pup in combat, Manfred von Richthofen said, "We saw at once that the enemy aeroplane was superior to ours." The Pup's light weight and generous wing area gave it a good rate of climb. Agility was enhanced by ailerons being fitted on both wings. The Pup had half the horsepower and armament of the German Albatros D.III, but was much more maneuverable, especially over 15,000 ft (4,500m) due to its light wing loading. Ace James McCudden stated that "When it came to maneuvering, the Sopwith (Pup) would turn twice to an Albatros' once ... it was a remarkably fine machine for general all-round flying. It was so extremely light and well surfaced that after a little practice one could almost land it on a tennis court." However, the Pup was also longitudinally unstable. At the peak of its operational deployment, the Pup equipped only four RNAS squadrons (Nos. 3,4,8 and 9), and three RFC units (Nos. 54, 46 and 66 Squadrons). 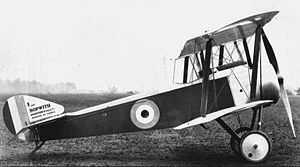 By spring 1917, the type was already outclassed by the newest German fighters and the RNAS had replaced theirs, first with Sopwith Triplanes, and then Sopwith Camels. The RFC Pup squadrons on the other hand had to soldier on, in spite of increasing casualties, until it was possible to replace the last frontline Pups with Camels, in December 1917. The raids on London by Gotha bombers in mid-1917 caused far more damage and casualties than the earlier airship raids. The ineffective response by British interceptor units had serious political repercussions. In response No. 66 Squadron was withdrawn to Calais for a short period, and No. 46 was transferred for several weeks to Sutton's Farm airfield near London. Two new Pup squadrons were formed specifically for Home Defence duties, No. 112 in July, and No. 61 in August. The first Pups delivered to Home Defence units utilized the 80 hp Le Rhone, but subsequent Home Defence Pups standardized on the more powerful 100 hp Gnome Monosoupape, which provided improved rate of climb. These aircraft were distinguishable by the addition of vents in the cowling face. Sopwith Pups were also used in many pioneering carrier experiments. On 2 August 1917, a Pup flown by Sqn Cdr Edwin Dunning became the first aircraft to land aboard a moving ship, HMS Furious. Dunning was killed on his third landing when the Pup fell over the side of the ship. The Pup began operations on the carriers in early 1917; the first aircraft were fitted with skid undercarriages in place of the standard landing gear. Landings utilized a system of deck wires to "trap" the aircraft. Later versions reverted to the normal undercarriage. Pups were used as ship-based fighters on three carriers: HMS Campania, Furious and Manxman. A number of other Pups were deployed to cruisers and battleships where they were launched from platforms attached to gun turrets. A Pup flown from a platform on the cruiser HMS Yarmouth shot down the German Zeppelin L 23 off the Danish coast on 21 August 1917. 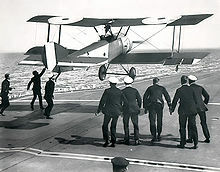 The U.S. Navy also employed the Sopwith Pup with famed Australian/British test pilot Edgar Percival testing the use of carrier-borne fighters. In 1926, Percival was catapulted in a Pup off the battleship USS Idaho at Guantanamo Bay, Cuba. The Pup saw extensive use as a trainer. Student pilots completing basic flight training in the Avro 504k often graduated to the Pup as an intermediate trainer. The Pup was also used in Fighting School units for instruction in combat techniques. Many training Pups were in fact reserved by senior officers and instructors as their personal runabouts. The Pup was officially named the Sopwith Scout. 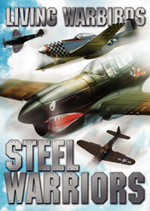 The "Pup" nickname arose because pilots considered it to be the "pup" of the larger two-seat Sopwith 1� Strutter. The name never had official status as it was felt to be "undignified", but a precedent was set, and all later Sopwith types apart from the triplane acquired names of mammals or birds (Camel, Dolphin, Snipe etc. ), which ended up with the Sopwith firm being said to have created a "flying zoo" during the First World War. Sopwith Admiralty Type 9901 The original Admiralty designation. Sopwith Pup Single-seat fighter scout biplane. Sopwith Dove Two-seat civilian biplane, only 10 were built. Alcock Scout Aircraft built partially from the remains of a crashed Pup. No. 5 (Training) Squadron AFC in the United Kingdom. No. 8 (Training) Squadron AFC in the United Kingdom. Several airworthy and static reproductions of Sopwith Pups exist today. 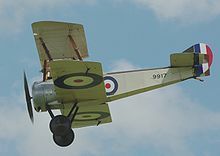 One example of a Sopwith Dove (G-EBKY) was converted to Pup configuration in the 1930s and continues to fly today, with the Shuttleworth Trust. A notable, and quite accurate flying reproduction, built in the late 1960s by the late Richard King, one of the co-founders of Old Rhinebeck Aerodrome along with Cole Palen, still exists at the Owl's Head Museum of Transportation in Rockland, Maine, and is still flown occasionally, with its original vintage First World War Le Rhx�ne 9C 80 hp rotary engine, at special events during their open season. An original 1917 Standard Motors built Pup B 1807, later registered as G-EAVX is slowly being restored to airworthy condition at RNAS Yeovilton (U.K.). This aircraft was originally fitted with a 100 hp Monosoupape engine along with the distinctive 3/4 vented cowling. It was refitted by the embryonic R.A.F. with an 80 hp Le Rhone engine in 1918 but retained the 3/4 cowling. It was bought privately at Croydon disposals in 1920 and registered in the U.K. as a private aircraft. It is the sole survivor of the six Sopwith Pups to be given a civilian registration (it is possibly the only surviving original Pup, tbc). The aircraft appeared on 16 July at the 1921 Aerial Derby (Hendon) where it was groundlooped by its pilot, but only slightly damaged. The aircraft never flew again and was "disposed of" in 1922. In 1973 the current owner discovered the remains of the aircraft in a barn in Dorset (U.K.) and has been rebuilding it since that date. It is hoped that the Pup will be flying again at the end of 2010, and will be repainted in its 1921 Aerial Derby colours. Bruce, J.M. "The Sopwith Pup". Aircraft in Profile, Volume 1/Part 2. Windsor, Berkshire, UK: Profile Publications Ltd., 1965 (4th revised edition 1976). ISBN 0-85383-411-3. Bruce, J.M. "The Sopwith Pup: Historic Military Aircraft No 6". Flight, 1 January 1954, pp. 8-12. Bruce, J.M., Gordon Page and Ray Sturtivant. The Sopwith Pup. Tunbridge Wells, Kent, UK: Air-Britain (Historians) Ltd., 2002. ISBN 0-85130-310-2. Franks, Norman and Harry Dempsey. Sopwith Pup Aces of World War I (Aircraft of the Aces). London: Osprey Publishing, 2005. ISBN 1-84176-886-3. Robertson, Bruce. Sopwith - The Man and His Aircraft. London: Harleyford, 1970. ISBN 0-90043-515-1. Thetford, Owen. British Naval Aircraft since 1912. London: Putnam, Fourth edition 1978. ISBN 0-370-30021-1. Winchester, Jim, ed. "Sopwith Pup Naval Fighter". Biplanes, Triplanes and Seaplanes (Aviation Factfile). London: Grange Books plc, 2004. 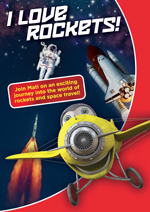 ISBN 1-84013-641-3. Sopwith Pup Pictures and Sopwith Pup for Sale.